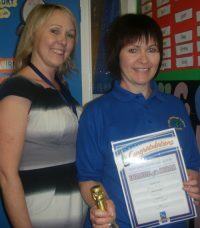 Debra Edwards from Ty Sign Primary has been awarded temp of the term by the Cardiff Special Education Needs (SEN) team. Debra’s Account Manager described her ‘positive attitude and reliability’ as two of the key factors in making the decision. Deb has been covering maternity leave in a behaviour class within the school for nearly a year now. She is described as a candidate who always stayed positive even though the class can be a challenge. Deb is very calm and patient with the children and always speaks highly of them. A few months ago she had an operation and she reluctantly had to take time off work. She couldn’t wait to return even though she wasn’t fully recovered. When her Account Manager from New Directions called her with the good news that she had won this award, she said that ‘she didn’t feel worthy’, but the team assured her that she truly was an inspiration.